Everyone likes George Clooney, don’t they? He’s witty, he’s charming, handsome, an advocate for good causes, blah blah blah… For all his easy on-screen charisma though, seeing one of his directing credits fills me with trepidation. Maybe that is unfair: Goodnight, and Good Luck is a good film. But then we come to his attempts to emulate regular collaborators like the Coen brothers. Do you remember Leatherheads? No, me neither. And the less said about The Monuments Men, the better. These films can at best be characterised as derivative and mishandled, however well-intentioned. The same, regrettably holds true for Suburbicon. Suburbicon fails on a few fronts but the most crucial one is its depiction of racial politics. And that’s a crucial thing to screw up on. To put this in context, Suburbicon follows too plots: one covering racist antipathy and violence from the white neighbourhood when the black Mayers family moves in, and another involving the spiralling consequences of a home invasion and murder. You might presume that these two plots dovetail or eventually cross each other. Nope. They remain entirely segregated. The white family are the focus of the script, the Mayers family get hardly any screen time or lines. We simply flip over to vignettes of racism when it is convenient to break up the white family’s story for pacing purposes or to heighten the drama. Worse still, the white Lodge family are drivers of their own action and plot. They do things, there are consequences, things spiral out of control, they develop and their characters are revealed. The Mayers sit and endure racism. That is all they are permitted to do. Relegated to an under-baked subplot, given next to no lines, no agency, and ultimately used to embellished the narrative of the white characters, you can see why Clooney’s treatment of the characters is irksome. I don’t think this arises from antipathy on Clooney’s part. The ethos of the film is that the wholesome image of 1950s American suburbia masks a cesspool of savagery. The stories of the Lodge and Mayers families are meant to parallel each other, but Clooney wholeheartedly privileges the Lodges with a story. Alas, that is not the only issue and the Lodges present their own problems. 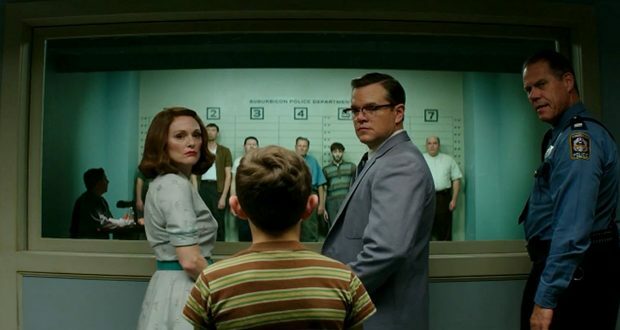 Suburbicon has a distinctly Coen Brothers feel to it. This is in no small part to the screenplay being based on one they wrote and abandoned decades ago that Clooney has decided to embellish. 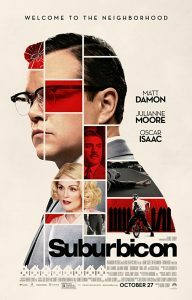 You could channel far worse creators but Suburbicon stylistically lacks identity and seems a simpering pretender. 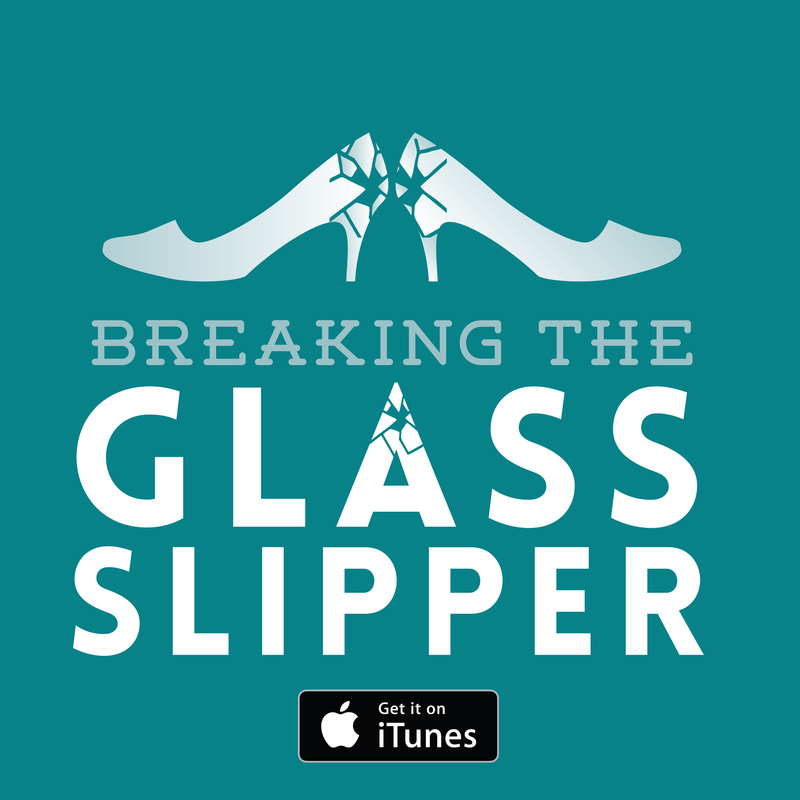 It is not as though we are seeing a Coen brothers’ screenplay reconfigured in the prism of another director’s talent to create an interesting collaboration. This film was shot by a man doing a poor job of copying them. At the very least, Clooney was not vain enough to cast himself. This time. And that screenplay is another issue. Those familiar with the Coen brothers will recognise elements from the Lodge’s story done infinitely better elsewhere. I am hardly the first to observe the similarities to Fargo. This feels like the first draft but with an extraneous racial violence subplot shoved in to suit the director’s laudable but deeply mishandled agenda. 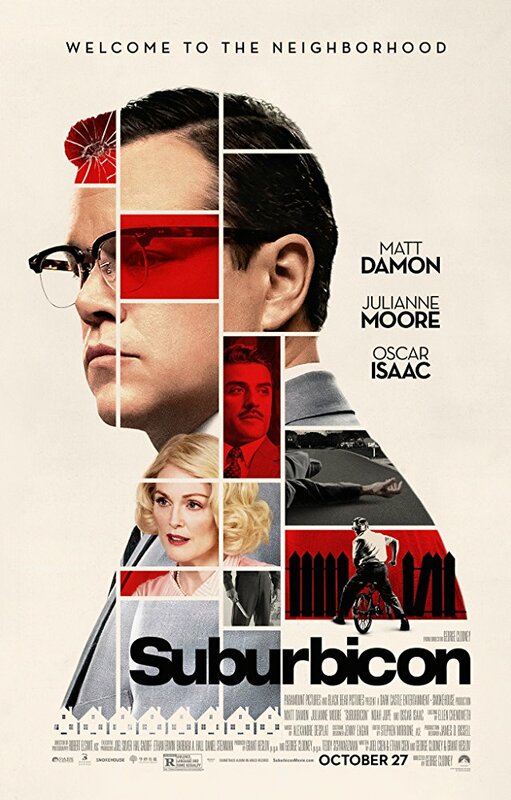 The solid work of the performers cannot rescue Suburbicon from its inherent problems. The thesis of ‘suburbia masks a dark underbelly’ is superficial, the racial politics are riven with white privilege, and the clear debt to the Coens only highlights the radical inferiority of this endeavour. Verdict: Clooney managed to strike out again. Next: Are we living in the Golden Age of TV?